Md. 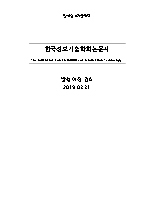 Tariquzzaman, Jin Young Kim, Seungyou Na, Hyoung-Gook Kim, Min Gyu Song,(2011).Reliability-weighted HMM Considering Inexact Observation For Enhancing Recognition Performance.한국정보기술학회논문지,9(2),43-55. 은닉 마코프 모델(HMM)은 음성인식, 화자인식, 필기체 인식, 제스처 인식 등과 같은 패턴 인식 분야에서 널리 사용되는 기술이다. 본 논문에서는 일반적인 HMM을 변형한 부정확한 관측 값들을 고려한 신뢰성 있는 가중 은닉 마코프 모델(RW-HMM)을 제안한다. 우리는 은닉 마코프 모델의 목적 함수에 관측 값들의 신뢰성 척도인 가중 인자를 도입하고, 변형된 HMM의 목적함수를 최적화하기 위해 일반적인 EM알고리듬에 기반 한 학습 알고리듬을 제안한다. 제안된 방법의 유용성을 검증하기 위해 본 논문에서는 ETRI의 화자 인식 데이터베이스를 이용하여 화자 인증 실험을 수행하였다. 실험 결과, 제안된 알고리듬이 기존의 방법에 비해 성능 향상을 보였고, 특히 잡음 환경에서 더 높은 성능 향상을 보였다. 결론적으로 제안된 RW-HMM은 잘 정의된 신뢰성을 바탕으로 어떠한 환경에서도 적용될 수 있을 것으로 생각된다. HMM (Hidden Markov Model) is widely used in pattern recognition areas such as speech and speaker recognition, handwritten recognition, gesture recognition, and so on. In this paper, we present a reliability-weighted HMM (RW-HMM) approach considering inexact observations. We introduce a weighting factor - confidence measures of observations - in HMM target function and drive a training algorithm based on the traditional EM (Expectation Maximization) algorithm for optimizing a modified HMM target function. To verify the usefulness of our proposed method, we performed SI (speaker identification) experiments using ETRI speaker recognition database. With the proposed RW-HMM, the experimental results show that the performance of SI is highly enhanced particularly in noisy environments. Finally, RW-HMM could be applied in any applications with well-defined reliability.